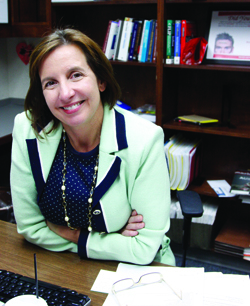 Ann Mirabito, an assistant professor in the Hankamer school of Business, sits at her desk Thursday afternoon. Mirabito owns Texarkana's Gunslingers, a minor league baseball team. Those who aspire to shape the minds that make our university -- the professors -- work tirelessly to equip students with the necessary tools to leave academia and make a difference in the world. Seeing them in a class setting only allows students to see a single dimension of their lives, but if students look past the books, past the professional attire and past their intimidating intelligence, there's another life waiting to be seen. Looking into Dr. Ann Mirabito's past will uncover an undergraduate degree from Duke University with an economics major, a master's in business administration from Stanford University and a series of successful jobs, including working for the Federal Reserve Board in Washington D.C. and Frito Lay, Inc., all of which have built an impeccable resume and paved the way for her and her husband Frank's next venture -- owning their own baseball franchise. "Two years ago (Frank) wanted to buy a boat," Mirabito said. "I thought it was just a vessel you pour money into. Then last year he decided he wanted to buy a minor league baseball franchise. Well, I wanted him to go back to buying a boat but by then he was already gone from that idea." A dream of purchasing a boat quickly sailed into a love for baseball, which the two shared even before they got married. When Mirabito and Frank decided to get married, they went to the Los Angeles Dodgers training camp for his birthday. They have always enjoyed baseball and when given the opportunity to purchase the franchise they "decided to go for it." Frank, being a successful lawyer, was less qualified than the administrative experience came in to play to run a business such as a baseball franchise. Enter Ann Mirabito. With a passion for business and administrative decisions, Mirabito grabbed the franchise's reigns and took control. "The process of making business decisions is enormously fun," Mirabito said. "It doesn't really both me if I make a bad decision because I think you learn from a bad decision. I've also always chosen to work for organizations that penalize sins of omission more heavily than sins of commission. Better that you do something and do it wrong than if you just sat on your hands and do nothing." This business, the Texarkana Gunslingers, just completed its first season ever as an independent baseball franchise. A member of the Continental Baseball League, which isn't affiliated with Major League Baseball, the Gunslingers went 38-34 and made it to their league championship to make their first season a memorable one. This league plays fewer games compared to the Major Leagues, and according to Maribito, this is where the vital business marketing decisions come into play. "It's incredibly busy because you're packing a years worth of activity into a three-month period," Mirabito said. "It also requires fast decision-making. There are only 34 home games in the season, so from a marketing perspective you need to watch really closely to what's working. You must make adjustments very quickly to the marketing plan so you can continue to leverage what's working and drop promotions that aren't working." It was a long journey before she actually acquired the team. After graduating from Stanford and getting married to her husband Frank, the couple became two working professionals conquering the corporate world. At the time Mirabito was the vice president and associate publisher of the Time Life Books' narrative book division, while Frank was a law partner for one of the top 10 most profitable law firms in the world. Seeing that she had reached the top in the corporate world, Mirabito and her husband looked at each other and said, "Maybe we could do something for somebody else for a change." They both resigned from their respective positions and sought a life in upper New York, where they both engaged in non-profit organizations for five years. After five years of non-profit work, a life of academia awaited. "One of the things I've noticed the more senior I get, is when I work with employees, they are struggling with what they're going to do in the beginning of their careers," Mirabito said. "I was excited about the chance to start teaching and to work with students that are at an early stage of trying to figure out what they're doing in their career. That's what you do as a professor help people shape their careers, so that's why I became a professor." More than just a professor, Mirabito doesn't need the boat her husband wanted. She can stay afloat in the professional sports world on her own.